At Notre Dame Academy, we turn little moments into big memories through recognizing the indispensable talents and wonders of each and every student. Notre Dame Academy is a perfect reflection of the proverb: “It takes a village to raise a child,” while the community is what makes-up the school, it’s the students, parents, teachers and staff together that create a village of learning. The NDA “village,” has a strong academic core, is centrally located near a business corridor, and offers a home base for those families with an appreciation for God’s gifts. Everyone here, including the parents, care about each child’s success! Notre Dame Academy, by definition means Our Lady, has created a Christ centered community for both kids and parents, with high educational standards taught by a well trained and dedicated group of teachers. It’s an amazing, loving, clearly Catholic education focused school, that embraces forward thinking and features small class sizes, has tight knit families and teachers that empower each child to remain ahead of the curve mentally, educationally and socially. So, when considering where to enroll your child in grade school, Notre Dame Academy makes the choice simple. At NDA, your child’s education will be enriched by a diverse population, multiple educational choices, dedicated staff and teachers, as well as the support of other families. All being found in a welcoming environment, where your child, a gracious gift from God will be encouraged to chase their dreams as we empower them to realize that anything is possible. Families are encouraged to take a tour of the school, meet our teachers, and experience the extraordinary community where children receive a great foundation of faith and learning. Many families feel that the school is a home away from home. We encourage you to bring your children to our Open House events. 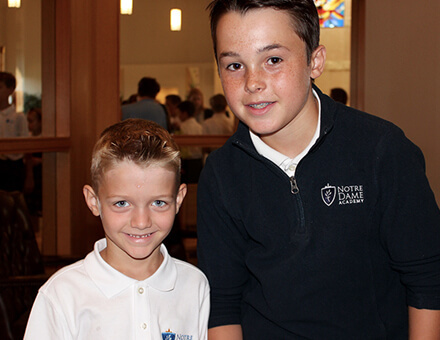 Visit NDA to meet our teachers, see the classrooms, and get a tour of the facility. All of our Open House sessions run from 10:00am until 6:00pm. Please stop in when it works best for your family! We welcome new students anytime throughout the school year. To help interested families, we offer tours year round. Please join us for an open house to meet our teachers and tour our facility. Children are welcome! Studies have shown that students coming from Catholic schools have higher high school graduation rates and enter college with more scholarships than students from other schools. A Catholic education is worth the investment in your child’s future. Tuition discounts are given to transfer students with a generous $1,000 the first year here. Parents can also earn a $1,000 discount by referring another family that enrolls in our K-8th grades and stays for the entire school year. Referral discounts are given the next year of enrollment. There are also multiple child discounts for families with three or more children.